Site to Site VPN technique establishes a secure tunnel between two routers across public network and local networks of these routers and can send and receive data through this VPN tunnel. MikroTik RouterOS offers IPsec (Internet Protocol Security) VPN Service that can be used to establish a site to site VPN tunnel between two routers. IPsec is a network protocol suite that authenticates and encrypts the packets of data send over a network. The goal of this tutorial is to configure a site to site IPsec VPN Tunnel with MikroTik RouterOS. So, for this entire tutorial I will show you how to configure IPsec VPN between two MikroTik Routers so that an IPsec VPN Tunnel can be established between them and local networks of these routers can communicate with each other. To configure a site to site IPsec VPN Tunnel between two MikroTik Routers, I am following a network diagram like the image above. In this network, Office 1 Router is connected to internet through ether1 interface having IP address 192.168.70.2/30. In your real network this IP address will be replaced with your public IP address. Office1 Router’s ether2 interface is connected to local network having IP network 10.10.11.0/24. Similarly, Office2 Router is connected to internet through ether1 interface having IP address 192.168.80.2/30. In your real network this IP address will also be replaced with public IP address. Office 2 Router’s ether2 interface is connected to local network having IP network 10.10.12.0/24. We will configure site to site IPsec VPN Tunnel between these two routers so that local network of these routers can communicate to each other through this VPN tunnel across public network. To configure a site to site IPsec VPN with MikroTik RouterOS, I am using two MikroTik RouterOS v6.38.1. IP information that I am using for this network configuration are given below. We will now start our site to site IPsec VPN configuration according to the above network diagram. Complete configuration can be divided into four parts. Basic RouterOS configuration has been completed in Office 1 Router. Now we will do similar steps in Office 2 RouterOS. Basic RouterOS configuration has been completed in Office 2 Router. Now we are going to start IPsec Peer configuration. After MikroTik Router basic configuration, we will now configure IPsec Peer in both MikroTik RouterOS. In IPsec Peer configuration, we will specify peer address, port and pre-shred-key. The following steps will show how to configure IPsec Peer in your Office 1 RouterOS. Go to IP > IPsec and click on Peers tab and then click on PLUS SIGN (+). In New IPsec Peer window, put Office 2 Router’s WAN IP (192.168.80.2) in Address input field and put 500 in Port input field. Choose pre shared key option from Auth. Method dropdown menu. Provide a suitable password in Secret input field. This password is required for IPsec authentication and must be same in both routers. IPsec Peer configuration in Office 1Router has been completed. Now we will configure IPsec Peer in Office 2 Router. We will do the same steps as Office 1 Router’s IPsec Peer configuration in Office 2 Router but only address parameter will be changed. In New IPsec Peer window, put Office 1 Router’s WAN IP (192.168.70.2) in Address input field and put 500 in Port input field. IPsec Peer configuration in our both Office Routers has been completed. Now we will start Policy and Proposal configuration for our IPsec VPN Tunnel. After IPsec Peer configuration it is time to configure IPsec Policy and Proposal. It is important that proposed authentication and encryption algorithms must match on both routers. In this example, we will use predefined default proposal. You will find default proposed authentication algorithms and encryption algorithms in Proposals tab. In this part we will only configure IPsec Policy on both routers. In Policy configuration we will specify source and destination network that will pass through IPsec tunnel and the mode of this IPsec VPN. The following steps will show how to configure IPsec Policy in Office 1 RouterOS. Go to IP > IPsec and click on Polices tab and then click on PLUS SIGN (+). New IPsec Policy window will appear. In General tab, put your source network (Office 1 Router’s network: 10.10.11.0/24) that will be matched in data packets, in Address input field and keep Src. Port untouched because we want to allow all the ports. Put your destination network (Office 2 Router’s network: 10.10.12.0/24) that will be matched in data packets inAddress input field and keep Dst. Port untouched. Now click on Action tab and click on Tunnel checkbox to enable tunnel mode. Put your destination network (Office 2 Router’s network: 10.10.12.0/24) that will be matched in data packets in Address input field and keep Dst. Port untouched. Put Office 1 Router’s WAN IP (192.168.70.2) in SA Src. Address input field and Office 2 Router’s WAN IP (192.168.80.2) in SA Dst. Address input field. Make sure default option is selected in Proposal dropdown menu. IPsec Policy configuration in Office 1 Router has been completed. Similarly we will configure IPsec Policy in Office 2 Router. The following steps will show the configuration of IPsec Policy in Office 1 RouterOS. In General tab put your source network ( Office 1 Router’s network: 10.10.12.0/24) that will be matched in data packets in Address input field and keep Src. Port untouched . Put your destination network (Office 2 Router’s network: 10.10.11.0/24) that will be matched in packets inAddress input field and keep Dst. Port untouched. Put Office 1 Router’s WAN IP (192.168.80.2) in SA Src. Address input field and Office 2 Router’s WAN IP (192.168.70.2) in SA Dst. Address input field. IPsec Policy configuration in Office 1 Router has been completed. At this point IPsec tunnel will be created between two office routers but local networks cannot communicate with each other. This is because both routers have NAT rules that is changing source address after packet is encrypted. Remote router receives encrypted packet but is unable to decrypt it because source address do not match address specified in policy configuration. The Solution is to set up NAT Bypass rule. We will now configure NAT Bypass rule in our both Office Routers otherwise local network will not be able to communicate with each other. The following steps will show how to create NAT Bypass rule in your Office 1 RouterOS. Go to IP > Firewall and click on NAT tab and then click on PLUS SIGN (+). New NAT Rule window will appear. In General tab, choose srcnat from Chain dropdown menu. Put Office 1 Router’s LAN network (10.10.11.0/24) that wants to communicate to Office 2 Router, in Src. Address input field. Put Office 2 Router’s LAN network (10.10.12.0/24) where Office 1 Router wants to reach, in Dst. Address input field. Click on Action tab and choose accept option from Action dropdown menu. Your newly created rule will be available in the list table. Now place this rule at first position by drag and drop otherwise this rule will not be workable. NAT Bypass rule in Office 1 Router has been completed. Similarly we will create NAT Bypass rule in Office 2 RouterOS. The following steps will show the configuration of NAT Bypass rule in Office2 RouterOS. Put Office 2 Router’s LAN network (10.10.12.0/24) that wants to communicate to Office 1 Router, in Src. Address input field. Put Office 1 Router’s LAN network (10.10.11.0/24) where Office 2 Router wants to reach, in Dst. Address input field. NAT Bypass rule in Office 2 Router has been completed. 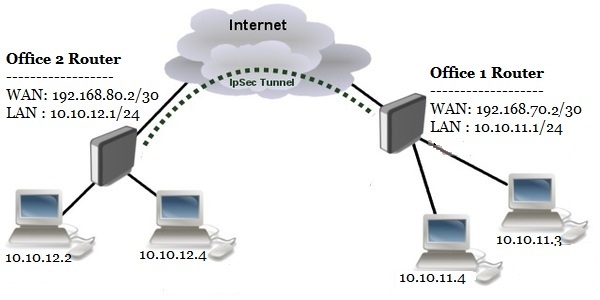 Now Office 1 Router’s local network will able to reach Office 2 Router’s local network through IPsec VPN Tunnel across public network and vice versa. To check your configuration, do a ping request from any local network machine to other local network machine. If everything is OK, your ping request will be success.